Take our recent experience with Valley National Bank, a 21.7 billion-asset commercial bank based in Wayne, N.J., which last year bought CNLBank in Orlando, a longstanding customer for our lockbox processing services. In 2014, CNLBank came to us to improve the automation of exception payments, including couponless payments. Outsourcing lockbox processing services like ours allows financial institutions to help their corporate accountholders by automating the receipt of payments and virtually eliminating the need for manual entry of those payments into their accounting system, such as Peachtree or Quickbooks. Many companies that use lockbox services send out statements or coupon booklets for their clients’ recurring payments, expecting their client to return the coupon with their payment to the assigned PO Box. But more and more people are not including the coupons when they mail their checks, as they either send the check without the coupon or pay through online banking. The problem comes when the account to be credited can’t be identified simply from the check - perhaps the name and address on the check does not match any account on file or the homeowner forgets to write their account number on the check. Traditional lockbox services would require a manual review of the payment and the client’s account roster to identify the correct payer and apply the payment to the proper client account. But Valley National Bank wanted us to improve this process, so we expanded our software suite to include our account validation service. Now when a check comes in, our account validation service can look across payment history or into an account list and see what checks that person has paid before, and we can then automatically apply that payment on the same day. Additionally, our account validation service has an exception keying service, so we’re taking the manual burden off the lockbox client. The CheckAlt Remit 4.1 and 4.2 releases introduced a completely redesigned, browser-based solution for both the financial institution and their account holders, which significantly reduces exception items while allowing them to easily decision the remainder online; monitor real-time (in-process) payment activity and receive a truly consolidated accounts receivable file that can integrate into any accounting system and includes all payment data for the day regardless of payment method or source. Our work with Valley National Bank did not go unnoticed by the industry. Indeed, CheckAlt and the bank were named recipients of Bank Director magazine’s Best of FinXTech Award for Payments Innovation earlier this year. Bank Director’s Best of FinXTech Awards recognize the successful collaboration between a financial institution and a FinTech company, which substantially improved an existing product or service, or introduced a new product or service which engaged customers, created new revenue opportunities and/or improved the financial institution’s competitiveness in the market. We pride ourselves on listening to our customers, taking their feedback and using that to improve our products. A lot of the software features and the services we provide today are a result of direct requests from our clients and our ability to work with them and be flexible. This is in contrast to some of the larger corporations’ life cycles and road mapsthat typically only make changes once a year – we’re much more flexible and can make improvements or add new features based on customer feedback much faster than the next cycle. Our work with Valley National Bank also demonstrates how financial institutions don’t have to always fear FinTech strictly as competitors – FIs can also collaborate with FinTech firms like us to provide superior back-end services, which ultimately results in superior service to their own customers. 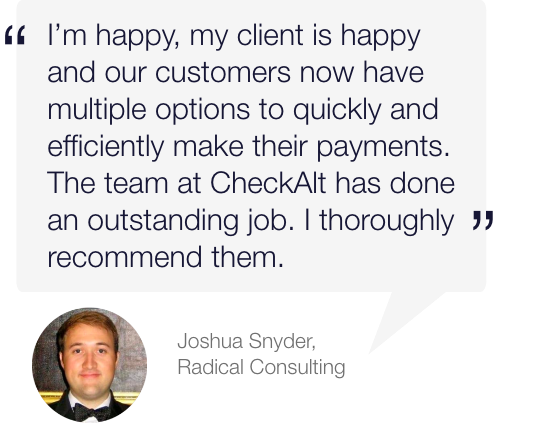 At CheckAlt, we’re not a threat—we are a highly desirable partner for banks and credit unions!